The MT Climbing Wall Instructor Training (CWIT) including Abseil Module is a 3-day course. The MT Climbing Wall Instructor Assessment (CWIA) including Abseil Module is a 2- day course. 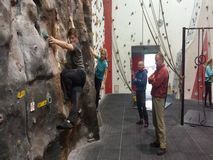 The Climbing Wall Instructor qualification is for climbers who are in a position of responsibility when supervising climbing activities on indoor or outdoor climbing walls, artificial boulders and towers. This includes a wide range of structures utilised for these activities which are referred to as ‘walls’. It is primarily concerned with ensuring good practice, leading to the safe enjoyment of climbing activities, and to an understanding of the sport.